During the winter months, Venice suffers from bouts of periodic flooding, known as acqua alta, caused by exceptionally high tides that occur in the northern Adriatic Sea. These floods lasts three to four hours, during which water pour from the canals onto the streets and inside buildings. Libreria Acqua Alta, a bookstore in Venice, has come up with a peculiar solution to the problem. 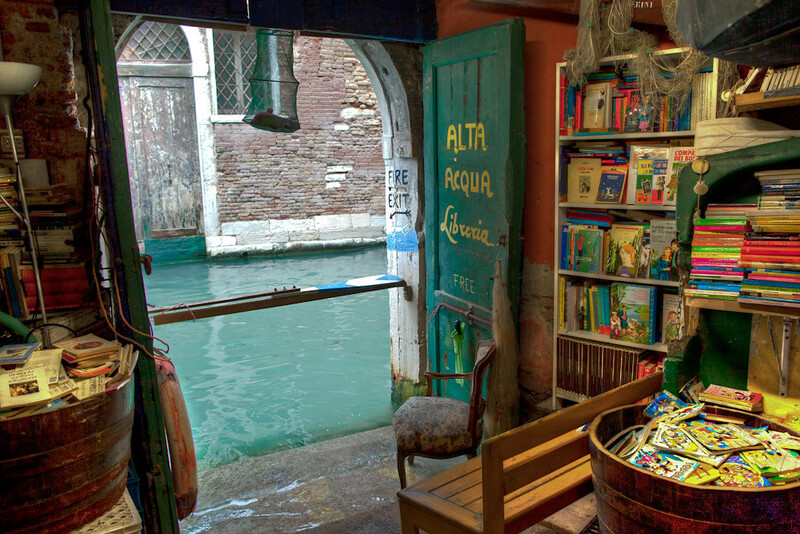 Libreria Acqua Alta, which literally means “library of high water”, is one of the many businesses in Venice that floods during acqua alta. As a countermeasure, the bookshop keeps books in bathtubs, boats and a gondola wherever there are chances of water getting in. 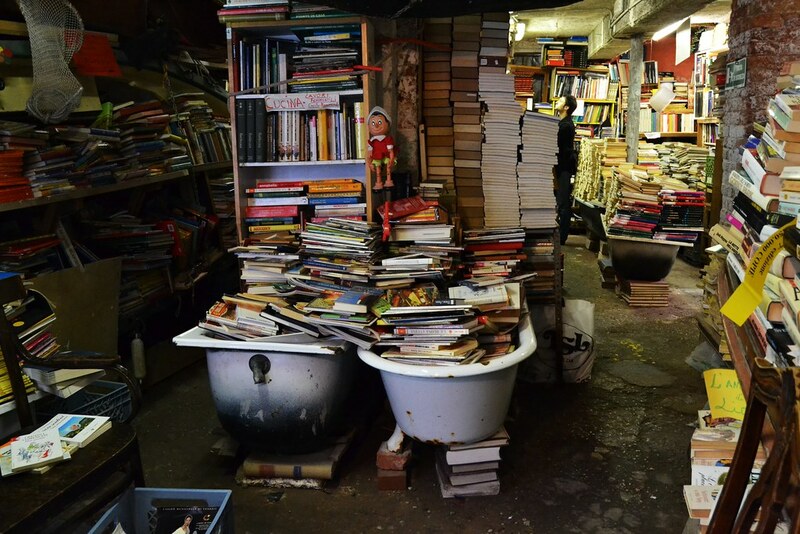 When the canal rises and the store floods with water, the books stay dry, thanks to their special storage spaces. The bookshop was founded by Luigi Frizzo in 2004, and since then it has become a unique attraction among Venetians and tourists alike. Aside from its ambience and atmosphere, the huge selection of books, both new and used, played a major part in the bookstore’s success. Not all books here are for buying though. Old encyclopedias and other thick volumes that no one buys anymore have been turned into objects of furniture and pieces of décor. Stacks of old books, worn by the water and salt, cover the walls from floor to the ceiling creating colorful surfaces. Others have become a staircase that invites visitors to climb and peer over the wall and into the nearby canal. The shop’s most famous feature, apart from the gondolas, is its fire exit, which leads visitors directly into the canal. 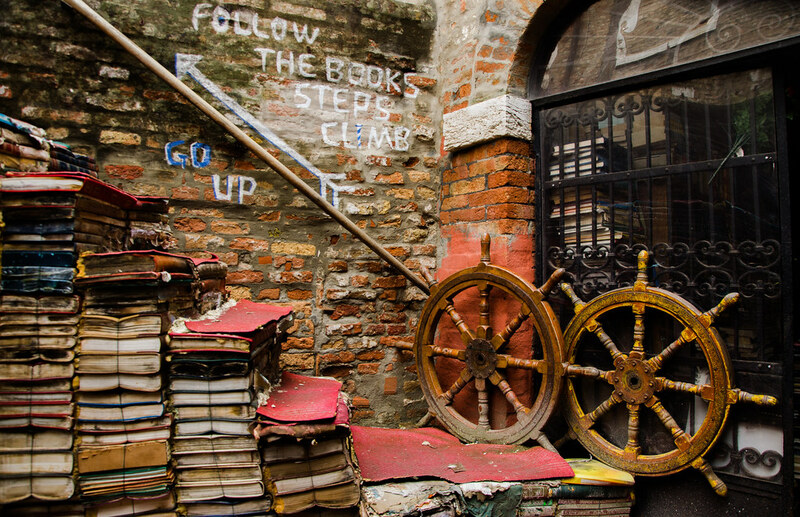 If you decide to visit, Libreria Acqua Alta is located off the Calle Lunga Santa Maria Formosa 5176/B in the Castello area of Venice.